Krishnan and I just experienced something extraordinary – a bunch of kids that grew up under disturbing circumstances (the Khmer Rouge killing fields) overcame those dark times to put up one of the finest shows that we have seen – rivalling even the Cirque du Soleil. It’s called Phare, the Cambodian circus and they have a daily show at Siem Reap. 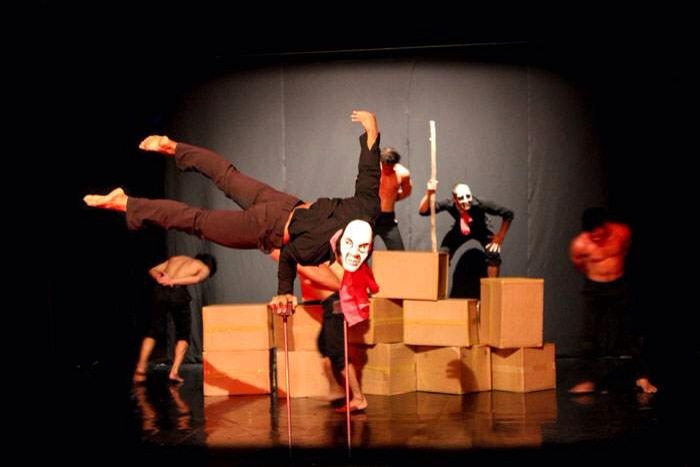 Read about them here Phare Cambodian circus. What was started by 12 students and their art teacher as a means to forget the atrocities they had suffered in the refugee camps 20 years back has become something unique. Today’s show was titled “Sokha” which is the real life story of one of the co-founders of Phare Ponleu Selpak. PPS is an NGO, setup in Battambang one of the largest provinces in Cambodia. Today it’s a regular school besides offering courses in arts, circus and theatre. Nearly 500 students study there. When we walked into the big red tent in the evening and took our seats, we thought the stage looked a little small and not enough audience. Soon the tent filled upto 70% and the show began. Some of the acts today were mind boggling, an arrow being aimed and fired at a balloon using the artist’s legs… Can’t describe it. There was a painter who did live painting as the show progressed to tell the story through the paintings. The act where one of the artists is balancing on a board that is on top of a long pipe and three layers are formed on top of him – mind boggling… Especially since many of us struggle to maintain our balance on firm even ground. This is an organization that is trying to provide vocational training so that these children can grow to earn a livelihood. They need a lot of donations and lots of support to help them along the way. Please share the link http://www.pharecambodiancircus.org with as many people as possible and also through social media. They are on Facebook and Twitter. And make it a point to get everyone who visits Cambodia to go see the show. It’s worth every minute that you spend there. Overwhelmed and deeply humbled … For what these kids have achieved overcoming their dark start. What a comeback ! Please do share. Thanks for checking.